For the launch of the new Ford Mustang Shelby GT500 during the North American International Auto Show (NAIAS) 2019, Ford wanted to give visitors a special experience of their new car. Action, racing and a stunning car that is lowered from the ceiling. It all sounds like an action film, but the experience was more than a film thanks to virtual reality. 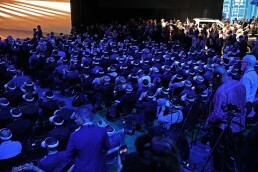 During the press launch at the NAIAS all 750 attendees got a Lenovo Mirage headset. A 360 video started during the presentation which made it possible to see the Ford Mustang Shelby GT500 for the first time in a virtual Detroit. The VR Owl team that was on site had installed and prepared all 750 headsets for the event in the previous two weeks. They also supplied the technology to simultaneously show the 360 video in VR to all visitors of the press launch. The Ford content was loaded in the VR Sync software. This software connects an unlimited amount of headsets to one device (laptop, smartphone or special event device) without the need for an internet connection, just a local network. VR Sync was integrated into the event’s Watchout system using OSC. 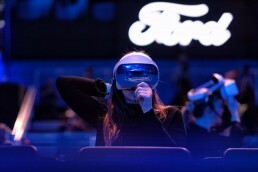 This allowed Ford to be in full control; they could play, pause and stop the 360 video automatically from the show system. In the 360 video the Ford Mustang Shelby GT500 raced through the streets of Detroit and ended up on a roof, after which it was transported by helicopter to the roof of the Cobo center, the event location. The headsets came off and the car was lowered from the ceiling so the visitors could see the car in real life. The Ford Mustang Shelby GT500 cut right to the chase. The combination of virtual reality and a car that was lowered from the ceiling caused a lot of wow reactions from the audience. The press caught on quick and different media communicated about the virtual reality launch. An amazing achievement of VR Owl’s event team!